Today we sit down to chat with Chase Donovan, hero from Magic Moment by author Angela Adams and featured in the Cruising for Love: 4 Ship-Shape Romances set. Ordinary. I got out of bed, drank my coffee, went to work at my father’s produce warehouse…drank more coffee…My job consisted of “shmoozing” the clients. I have a very gregarious personality. To get away from the tediousness of the warehouse business, I’d head to Atlantic City and the casinos. I’m pretty good at the Black Jack tables. Whenever I felt the need to just relax, I’d drive up the coast to Magic Lake Island where I keep a boat. One night, after a round of gambling with my college buddies, I headed to Magic Lake for some quiet, peaceful soul-searching. Thanks to Angela Adams what I found when I got to my boat was anything but tranquil and relaxing. After Laura and I got involved in Angela’s drama, I was forced into admitting that I sometimes turn a blind eye to the negative characteristics of others. Kind of if I pretended undesirable aspects didn’t exist, then they weren’t there. It was while getting to know Laura better, and going through our dangerous adventure, that forced me to acknowledge this trait in myself. Finding Laura involved in a vicious assault, coming up with a quick plan to stop it, and going on the run with her. Well, here I was…minding my own business, leading a quiet, passive life, and this Angela Author Person drops me into the middle of this chaos. Well, once I admitted my true feelings for Laura, I had to see the situation through to the end and make sure we stayed safe. Not to mention that in writing her story, Angela forced me to admit some things that I had ignored about my past and people in my life. That Laura will be physically harmed. These guys are after her, and we can’t figure out why. We’re on the run to keep her safe and get to the bottom of this mystery. I didn’t know it until Laura and I were trying to stay one step ahead of the bad guys, but being with her makes me happy. Although, I truly wish Angela had found a less dangerous way for me to discover how much I love being with Laura. First of all, finding Laura on my boat with those creeps wouldn’t have been part of the deal. I still don’t know how I came up with that quick idea that saved her life. Then, the meeting I had in my father’s office with my father, and his business partner, Oliver Daniels. It pains me to think about that day…I would have hoped to have had a different, more peaceful, less tragic outcome. Writing and reviewing contemporary romances, Angela Adams’ work has appeared in Romance at Heart, Oysters and Chocolate, Whipped Cream Reviews, Long and Short Reviews. Her short story, “Burgers and Hot Chocolate,” was featured in the anthology, Winter Wonders published by Whimsical Publications. Her romantic suspense novel, Magic Moment, was published by Crimson Romance. Angela is a member of Romance Writers of America. Growing up in Philadelphia, PA, her passions are reading, strolling through Philadelphia’s Historic District, and cheering for the Philadelphia Phillies. With summer on the horizon, I’m getting my boat ready for another adventure. Hopefully, a serene and quiet one. 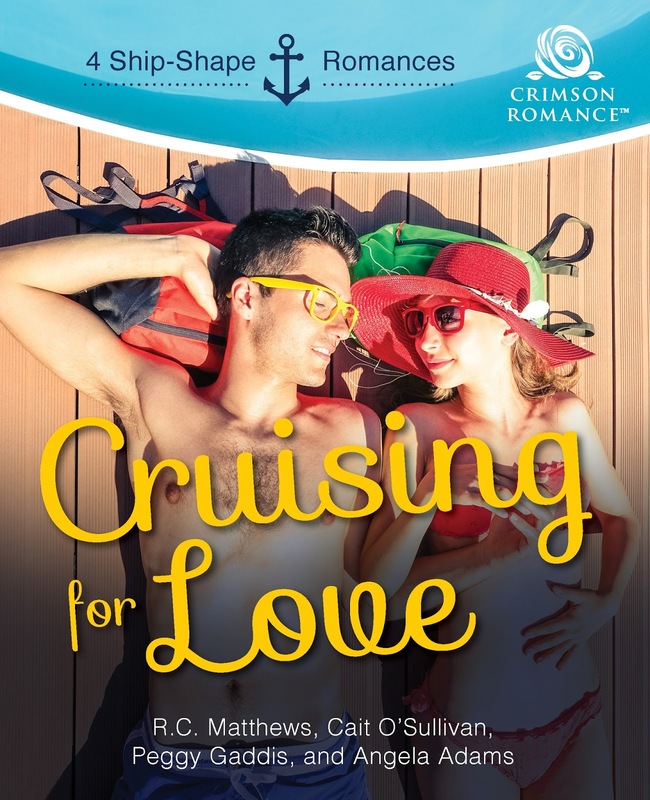 Set a course for adventure with these four couples as they take to the high seas only to find new romance. Thank you for giving Chase a chance to be in the spotlight. He's not comfortable being the center of attention, but he deserves it. Chase is a true "hero." Happy to have him, Angela!